Learn how to get started with NI myRIO by exploring its features and taking your first measurement. Learn about using text-based code with myRIO. Learn about using Data Dashboard with myRIO. Learn about PIDs in myRIO. See tips for troubleshooting with myRIO. This video teaches how to set code to begin running as soon as a RIO device is powered on. This video teaches how to use bitfiles to share code. This video teaches best practices for saving code. NI created myRIO to help you design real-world systems in a single semester. To make sure you are successful, the company worked with Professor Ed Doering, PhD, at the Rose-Hulman Institute of Technology to produce the myRIO Project Essentials Guide, which is the ultimate resource for system design with myRIO. This guide is based on the myRIO Starter Kit and the Mechatronics and Embedded kits, but NI is constantly expanding it, so check back often for updates including vision and CAN. myRIO features the Zynq chip from Xilinx, which includes a dual-core ARM Cortex-A9 processor and an FPGA that are fully programmable in LabVIEW for complete system design. 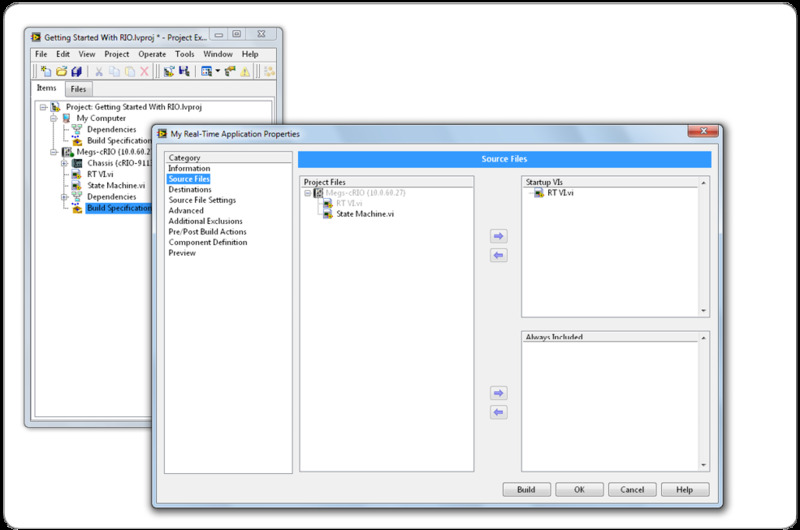 You also can combine other programming paradigms with myRIO and LabVIEW. On the processor side, you can directly program the myRIO processor with C or C++ using Eclipse. If you choose to program the processor with LabVIEW, you can incorporate other programming paradigms such as .m script directly on the LabVIEW block diagram using the LabVIEW MathScript RT Module. Finally, when programming the FPGA, you can incorporate your own Verilog or VHDL in your LabVIEW FPGA code. WiFi is a key myRIO feature that you can use to remotely deploy code and monitor data. Data Dashboard for LabVIEW is a free app for both iOS and Android that helps you integrate smartphone and tablet technology with myRIO. The steps to get started with Data Dashboard are straightforward, and incorporating the technology helps you more fully take advantage of myRIO’s WiFi feature. A common application area for myRIO is control. With the LabVIEW Control Design and Simulation Module, you can graphically implement your control algorithms such as proportional integral derivative (PID) control. The “Design Real Systems, Fast With NI myRIO” hands-on session provides detailed instructions on implementing PID algorithms on myRIO. Ensure you have the correct software installed. 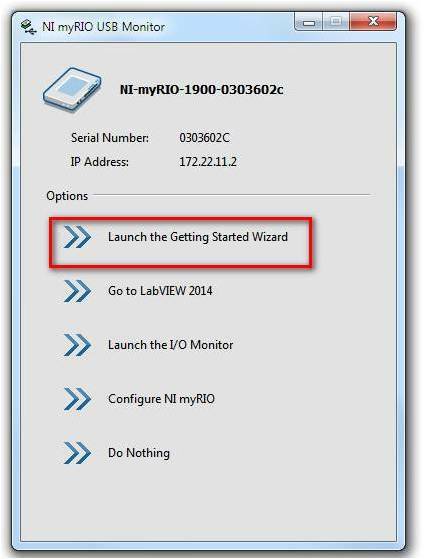 Run the Getting Started Wizard to ensure this software is flashed to the myRIO. 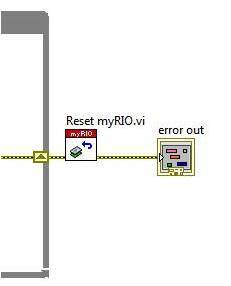 Remember to place the Reset myRIO VI at the end of your code to ensure all references are closed correctly. Having an application run as soon as your reconfigurable I/O (RIO) device has power can be useful for many applications such as robotics or medical device prototyping. In these instances, you want code to run immediately when the RIO device is turned on. 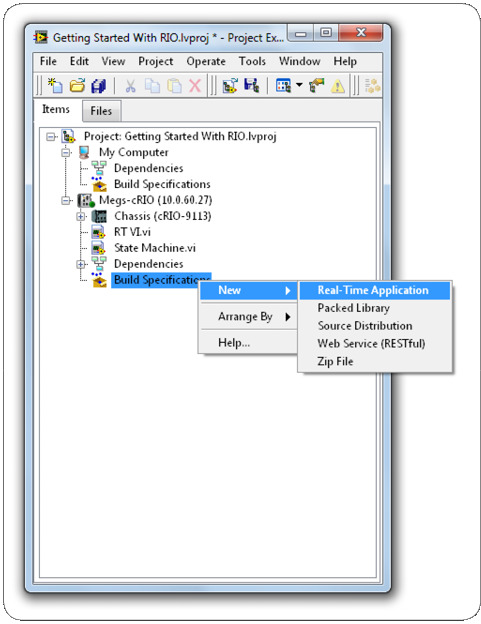 In an NI LabVIEW project with your RIO device added, right-click Build Specifications and select New»Real-Time Application. This opens a dialog that offers many options for real-time code like naming the build specification and choosing where it is saved on disk. The Local Destination Directory refers to the location on your host PC where the built files are saved. The Target Destination Directory refers to the location where the built files are saved on the target. In most cases, these can be left as default. Click on the Source Files tab. Here you can choose the VI that you want to run when this application starts. 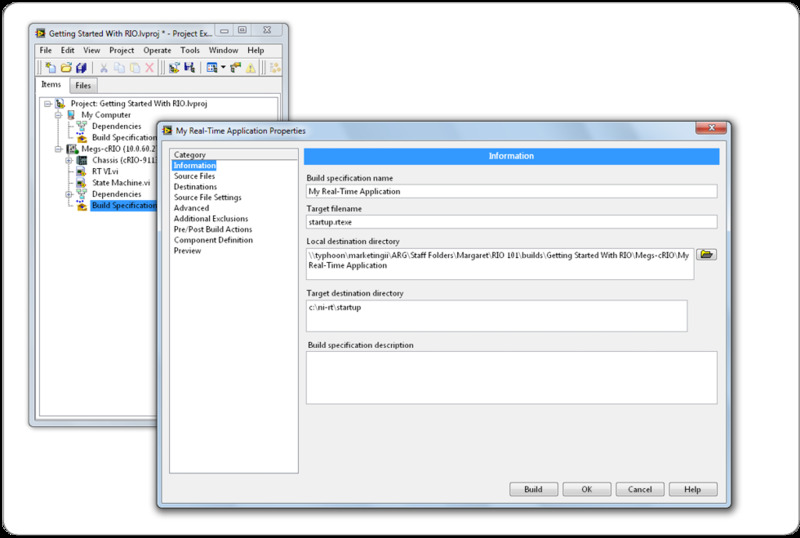 Select Build to build the application. 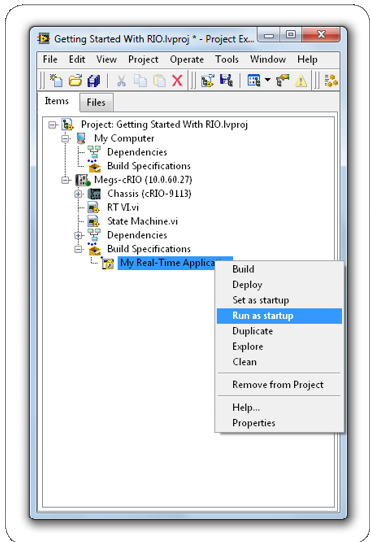 After the application is built, right-click to set the application to run as a startup application. This VI now runs every time the RIO device has power. You no longer need to connect the RIO device to a host PC to run the code. Every time an FPGA VI is compiled, a bitfile is created. This file contains the raw compiled FPGA code. This can be useful if you want to share compiled code with a friend. By using the bitfile, you do not have to share the entire project with all the VIs. You can simply email them the bitfile. One thing to note is that bitfiles are compiled for specific RIO configurations. If you change hardware devices or use different modules than what the bitfile was compiled for, it becomes incompatible. 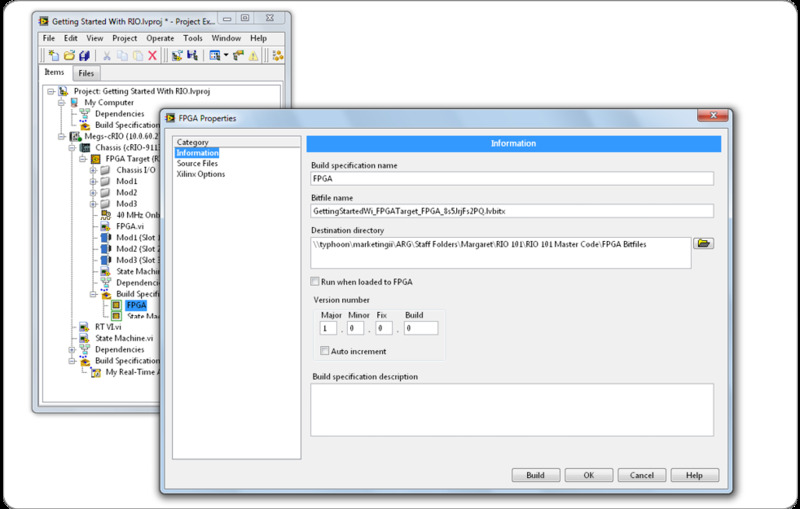 Right-click on any FPGA build specification, select properties, and review the options available. You can name the FPGA bitfile and choose the location where it is stored. Additionally, if a friend shares a bitfile with you, you can point an Open FPGA VI Reference to a bitfile. If you create a new VI and add it to the project, save it in the same directory or subdirectory as the project. This helps when you’re trying to share your project with a colleague. You can just share the entire folder that the project is saved in and know that you have captured all of your content. If you save VIs in completely different directories, possibly even on different drives, you may have difficulty moving your project at a later date. Ready to put your RIO skills to the test? Complete this sample project and build a temperature sensor for your RIO device.